Reviewing A Classic, Ozu's Late Spring. Calmness, serenity, nature in full blossom. The pace is slow - classic Ozu. The characters are the familiar troupe that Ozu likes to work with, somehow I feel like I'm watching the same previous movie of Ozu. The music seems dated and scratchy, something to be expected of old movies. Acting is subdued. The wife asks me what movie I'm watching, I respond, "Ozu's Late Spring" and she exclaims, "I love Ozu's movies!" 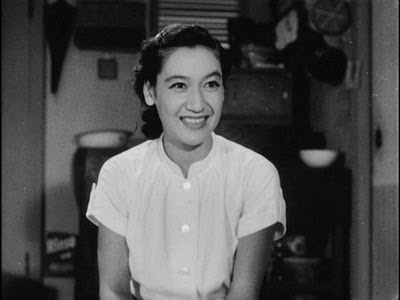 That makes me think that Ozu's work seems almost tailored made for women, it is foremost about relationships and pithy back and forth small talk, small escapades, a chance meeting between the daughter and a professor, she needs to buy sewing needles, he agrees to accompany her. Such pleasant fortuities are a trademark of Ozu. We learn that the daughter is 27 and still living at home with her father, recovering from some disease but still a model child. What is the problem here and why has she not found a man? Just about everyone is trying to hook her up, someone has just the man for her, he's 34 and looks like Gary Cooper, at least from the nose down it is claimed. Noriko (the daughter) finally admits, if she leaves home her father "would be lost" without her. Noriko's friend offers her some cake. She refuses, "This just goes to show you need a man" her friend responds. Noriko storms out of her house. All the while Ozu's gentle touch with the camera pervades the scenes. People leave the shot and re-enter it - yet the camera remains motionless, stoically. The father apologizes for having kept Noriko for so long. Sweet words from a sweet man from a sweet plot and a sweet director. Everything from Ozu is sweet and delicate, birds chirp away, the camera cuts to various scenes of flowers and nature, the gentle touch of a lover. The father tells her he plans to remarry a woman they saw at a play earlier and Noriko is crushed. Noriko we later learn has agreed to marry Mr. Gary Cooper look alike who at this point we still have not met and never will (what a different approach a western director would have attempted) yet Ozu is not interested. The wedding is not shown. "It was the biggest lie of my life" says Noriko's father as he confesses that he never had an intention to remarry anyone. The lie worked, it got his daughter out of the house and into her own life. A man comes home and the house is alone deserted, he sits down and misses his daughter greatly. What is to say about the films of Ozu that has not already been written by countless film scholars and critics? It is definitely a change of pace from the brainless action "flicks" we are so used to in western cinema. It is more like reading a novel. Quite serenity - when you want to get a way from problems and people, put in an Ozu movie and relax and be at peace with one of cinema's greatest masters. While Late Spring is not my favorite Ozu film it is still leagues above most junk being discharged today. The final scene of Late Spring is of waves rolling in from the sea, quiet yet distressing. Life goes on despite it all. Such a gentle and sweet story would never work in today's Philistine cinema. I just watched this today. I too am a big fan of Yasujiro Ozu. Like a quiet poem of simple slice of human life. So much is said in the quiet moments. So moved by the honoring of her father, in her wedding kimono. Subtlety, an art that has been lost today. I as well go back to the films of Ozu when I need a quiet moment in a life where subtlety is rarely recognized or acknowledged anymore. 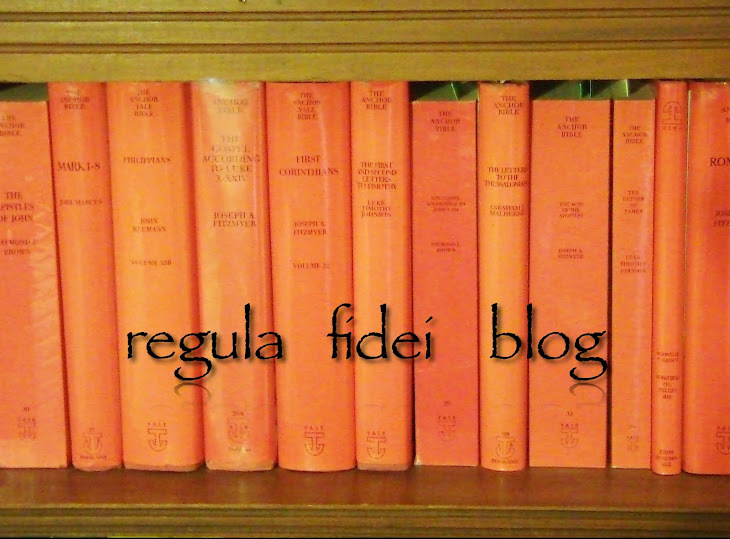 This blog is dedicated to the Regulae Fidei, the "Rule of Faith," or the historical Patristic interpretive tradition which together with Scripture, are the joint sources of faith and morals - for the Church Catholic. The team of contributors is listed above and are from diverse theological viewpoints. This blog is not just about Christian Theology but we comment on all things that can be an interest to intelligent readers. Regula Fidei's Suggested Peer Reviewed Journal's & Publishers. Bibliotheca Sacra (Dallas Seminary Journal). Catholic University of America Press. Emmaus Road Publish. (Catholic Press). Harvard Theological Studies (Dissertation Series). Journal of Biblical Literature (JBL). Journal of Early Christian Studies (North American patristic research). Journal of Ecclesiastical History (Journal of early church history). Novum Testamentum (Higher Critical Journal). Revue Biblique (Dominican Academic Journal). The Downside Review (Benedictine Theological Journal). The Heythrop Journal (Philosophy and Theology). Vladimir Seminary Press (Orthodox Publisher).